Mr John Pearson , first man in the UK to throw down a back flip on a motocross bike,from up north, confirmed for this years Big Air Jam June 6th at Parc Y Scarlets. 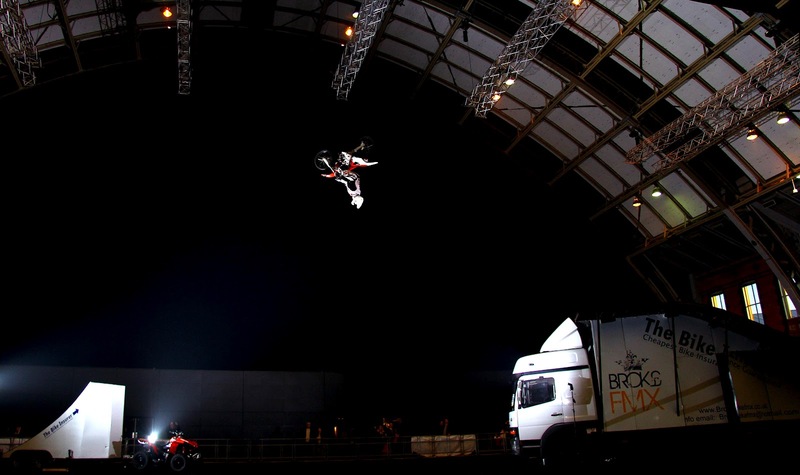 John is quite simply a legend among the freestyle community for being the first ever British rider ever to sucessfully land the "Holy Grail" of freestyle tricks, the 360 backflip. Despite ‘Big’ John’s ample frame (6’4” tall, 5’2” wide) he is remarkably rapid in a Go Kart. Having seen John’s driving style this is probably down to pure aggression, highlighted no better than via his very-own Go Karting motto, “If you’ve not hit the tyres, you’re not going fast enough”. John recently featured in the recent “Ben 10: Ultimate Alien” show at the packed out 02 Arena in London, in which he performed an array of crazy, yet somewhat pointless, stunts in front of screaming 8 year-olds. If you are not familiar with ‘Ben 10’ then ask your children and let us know, as we don’t know what it is either.